Lil’a restaurant is part of The Museum Hotel. The hotel’s location and beauty is quite unique, and it is the only hotel in Turkey within the Relais & Châteaux family. 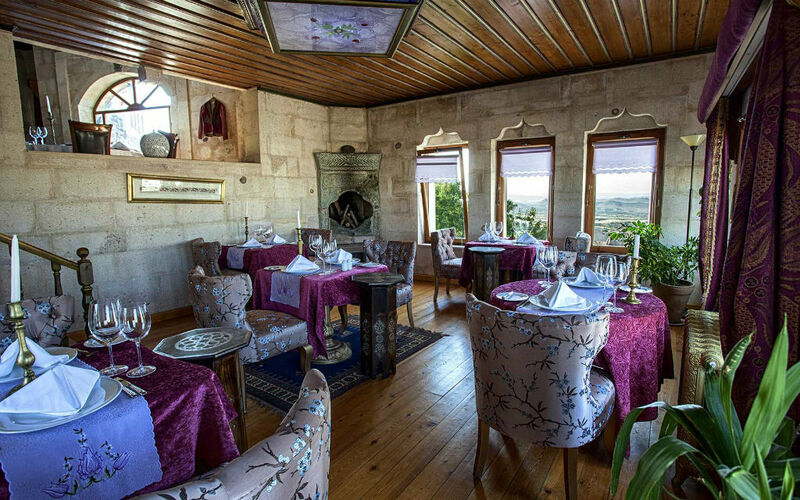 The restaurant is decorated in a similar way to the rest of the hotel: antique carpets hang from walls, while framed felt artwork and Ottoman dresses are housed behind glass. 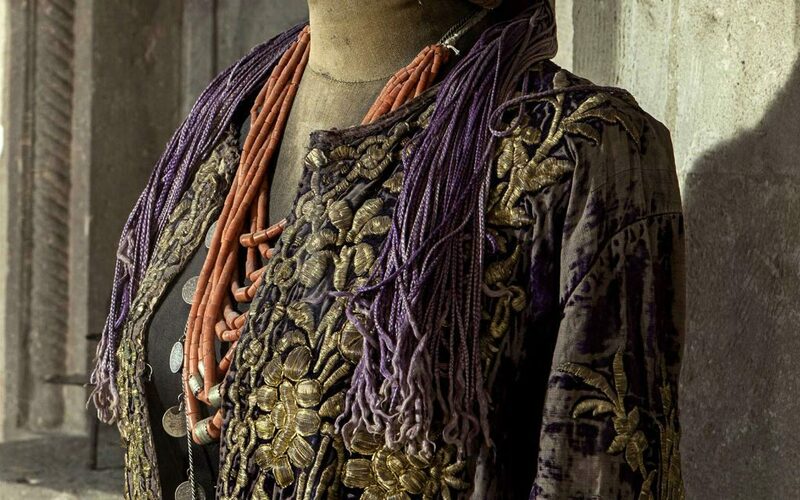 The tables are adorned with orchids, ottoman style brass candlesticks and voluminous crystal glasses. Before settling down to your table in the restaurant, however, be sure to take an aperitif or two at the hotel’s terrace bar. Few bars in the world can claim views of such geological magnificence, and the rocks of the valley positively glow as the sun starts to dip towards the opposite horizon. A range of classic cocktails are competently mixed behind the stonework cavern bar, and you have the choice of a table on the outer terrace beside the Romanesque pool, or up on the covered loggia, where one can lounge on cushions, fondly imagining oneself master (or indeed mistress) of all that one surveys. One descends a few steps into the rock itself to enter the restaurant. The room is cavernous (obviously, given that it is excavated from solid rock) and wood-clad, with central pillars. The room is carefully lit, and has an opulent and somewhat mediaeval feel to it. Uchisar is the highest peak in Cappodocia, and the window table at which we were seated looked out over a vast expanse of the region. Goreme Valley, Red Valley, Ortahisar and the White valley were all spread out beneath us; and as the evening drew in, the lights of Goreme appeared and the landscape took on a spectacular and somewhat spooky aspect as the shadows closed over cave mouths and the dramatic rocks rose out of the creeping darkness. The à la carte menu uses the freshest produce – the fruit and vegetables have either being grown on site in the gardens of The Museum Hotel or sourced locally at nearby village markets. Lil’a prides itself on offering traditional Cappadoccian dishes not to be found in other restaurants. 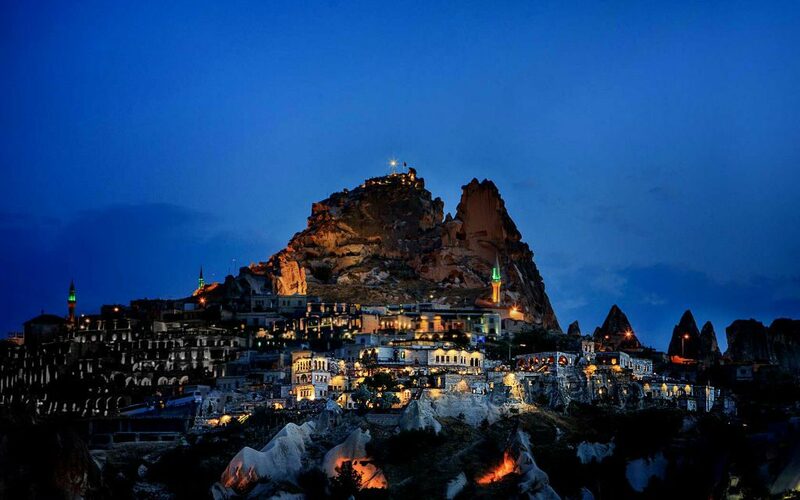 Tall, Dark and Handsome tucked into a Nevşehir Tava, which left him in raptures. 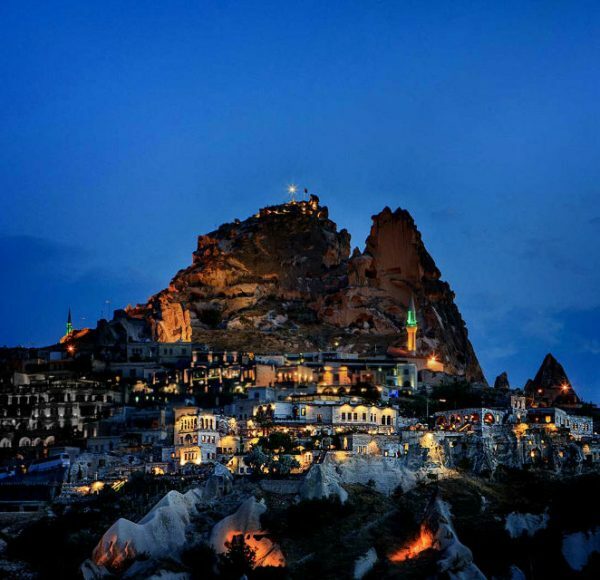 We have been living in Turkey for seven months and he declared it to be the finest dish he’s had thus far, and that he fully intended to return to Cappadocia for no other reason than to enjoy it again – high praise indeed! The Tava consisted of tender lamb, cooked and served in a skillet with onion, tomato and chilli, the simple flavours of the top-notch produce knitted together to form a robust and homely dish. I was similarly impressed by my chicken stew, served in the terracotta pot in which it had been cooked. The texture and flavours were subtle and unusual, and it shared with the Tava that hard-to-produce impression of a simple rustic meal which nonetheless contains a depth of flavour that only an expert can attain. 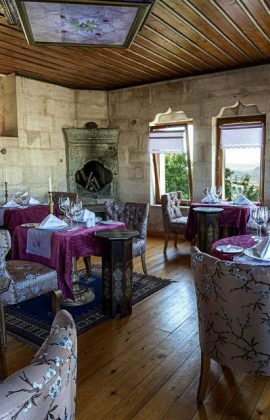 Lil’a is the only American Express Selects Restaurant in Cappadocia and the only Relais & Chateaux restaurant in the whole of Turkey and we could see why it has attained these accolades. 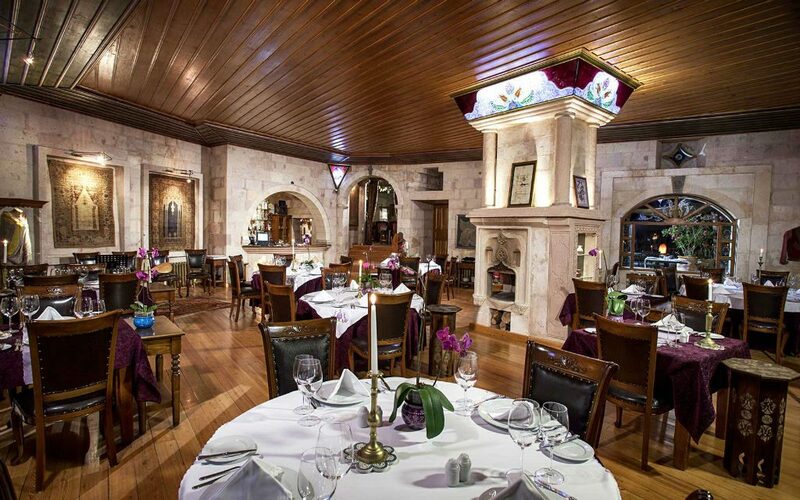 The restaurant also offers cooking classes; the “Journey of Taste” is an interactive workshop run by the award-winning chef Mustafa Buyukhan, and the course explores Anatolian and Cappadocian flavours and techniques. 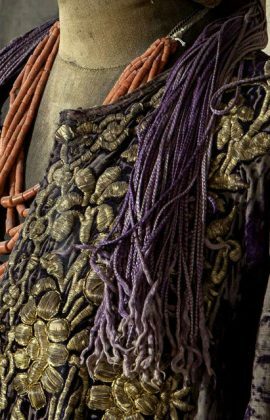 The staff wear traditional dress, charming in itself, and as people are a true delight. They had excellent English and yet were willing, and seemingly delighted, to spend time throughout the evening assisting us with our (as yet) rudimentary Turkish, helping us to perfect our grammar, teach us new words and praise us enthusiastically as we stumbled through it all. Our main courses were deliciously filling and we opted to share a dessert. A simple pancake and ice-cream completed what had been a very enjoyable and relaxing meal. We sat and enjoyed the view, sipping a locally produced wine and marveling at the landscape that stretched out below us.